Facing protests at its annual shareholder meeting, McDonald's is pushing back against what it calls a "union attack" on its brand. 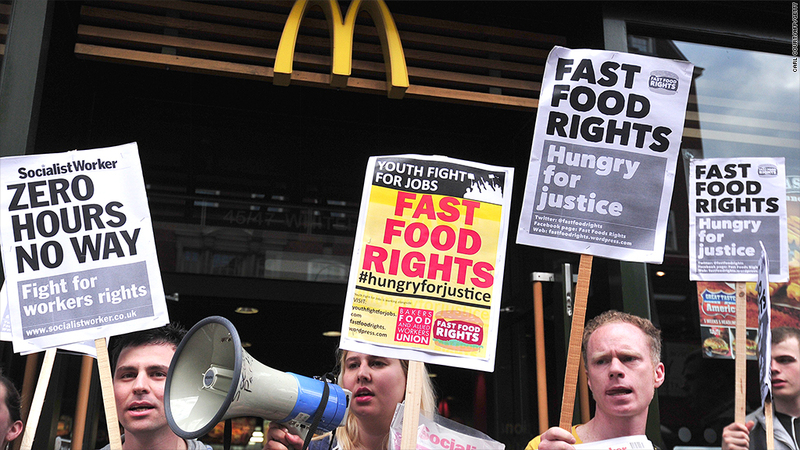 McDonald's charged the demonstrations are part of an $80-million publicity campaign by the Service Employees International Union, which is working to organize workers across the fast-food industry. "The union has spent its members' dues money in the past two years attacking the McDonald's brand...in an unsuccessful attempt to unionize workers," the company said in a statement. About 1,000 protesters marched Thursday to McDonald's corporate offices in Oak Brook, Ill., where the fast-food chain was hosting its shareholders. A group of workers wearing McDonald's uniforms delivered "boxloads of petitions directly to shareholders," according to protest organizers. It was the second day in a row that workers targeted the McDonald's (MCD) meeting, which was closed to the press. On Wednesday, protesters marched outside the company's headquarters carrying a large banner and shouting slogans like "We want change and we don't mean pennies." Organizers said 5,000 fast-food cooks and cashiers joined in Wednesday's march, though local police counted only 2,000 people. Fast food workers and those in other low-wage jobs have been taking to the streets over the past two years to demand wages of at least $15 an hour. Last year, more than 100 workers were arrested at McDonald's annual shareholder meeting. Many McDonald's workers say they are forced to rely on public assistance, while the company has rewarded investors by buying back billions worth of stock over the years. "It's time for McDonald's to respect the workers on the front lines as much as they have respected shareholders by putting $30 billion in their pockets over the last 10 years," said SEIU president Mary Kay Henry. McDonald's said the company and its independent franchise owners "are standing strong and together in the face of this union attack."